With the first big hatches of the year expected any day, my thoughts turn to springtime in other years. A time of renewal, spring is one of my favorite times of the year. When the first bluebirds and robins begin making their appearance, I develop what quickly becomes a full-blown case of spring fever that is not satisfied until I find myself on a mountain stream. The entire winter has been spent looking forward to this moment when the trout rise methodically to the sudden abundance that surrounds them. All it takes is a reasonably good match to create an afternoon of memories that will be forever etched in your memory. I remember that day at Metcalf when I found that I had the water to myself one evening as the bugs poured off and the fish rose with abandon. Those are the days that fly fisherman long for and that keep us returning to the stream. For the dedicated fly fisher, those first days of spring are marked by the arrival of bugs with names like Quill Gordons and Blue Quills. With the burst of new greenery on the trees still weeks away, these bugs along with others continue that never ending circle of life where they in turn sustain life in the trout. Early in the season the weather can be difficult. If you happen on the stream during one of those rare days where everything comes together, a blizzard of insects may be your reward along with many foolish fish. I will never forget the first time I encountered an early season hatch. Young and inexperienced, I was in awe of the activity around me and vowed to someday learn how to catch all the fish that I suddenly realized were in the stream. One of the biggest lessons I have learned since is that very few hatches are as impressive as that one that inspired me years ago. The past several weeks I have been tying bugs just for such an occasion. If fisherman are good at one thing, it is being optimistic. Every year I tie hundreds of flies with the hope that I will catch enough fish to in turn lose that many flies. In fact, it is impossible for me to go on a fishing trip and feel prepared. There are always a few more flies that could have been tied. It is ironic then that every spring brings the same routine calling for the same flies. Oh, I have plenty of new ones to try out but somehow I always end up fishing the same reliable patterns. 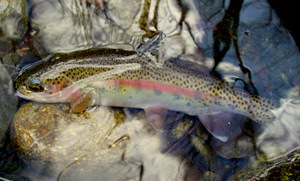 In the Smokies, a few Parachute Adams in sizes #12-#18 will cover a lot of hatches early in the season. Just in case, I carry a few Quill Gordons for those picky fish that want something a little more exact. A few tiny Blue-winged Olive patterns along with a handful of caddis and stonefly patterns round out my selection of dry flies. For nymphs, I always carry Pheasant Tail nymphs and Gold-ribbed Hare’s Ear nymphs in a variety of sizes. As I tie these flies, I remember the 17 inch brown that ate a Tellico in a deep hole early one March and tie a few more just in case. Tellico nymphs are a necessity and when all else fails, a soft hackle can save the day. I always have lots more patterns in my fly boxes but return to these same ones every year, not because I have a hard time changing but because the old standbys catch lots of fish. That first trip of spring always has me as excited as a small child at Christmas. It is hard to sleep the night before I head for the mountains. 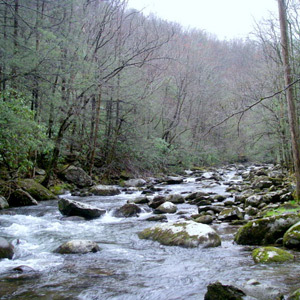 As soon as I arrive at the stream of choice, I gear up as quickly as possible and head towards the water. Before tying on a fly, I’ll walk the stream bank for a few minutes, observing the water and streamside rocks for insects and rises. Most of the time I’ll tie on a dry regardless of whether or not there is much surface activity just because I have been looking forward to this for so many months. On a good day, the dry catches fish consistently but often I resort to nymphs. 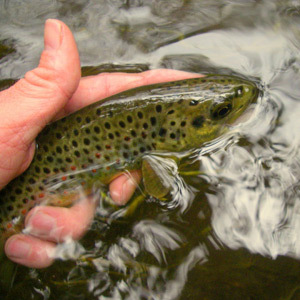 This time of year is one of the best to spend looking for large fish feeding on hatching insects and sometimes I’ll spend a few hours just checking the best pools for large trout. Please also check out our main website www.littleriveroutfitters.com for daily fishing reports, message board and online catalog.